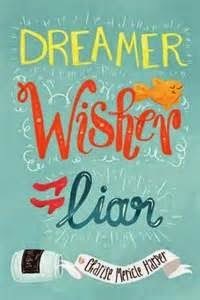 Dreamer, Wisher, Liar, by Clarise Mericle Harper (Balzer + Bray, April 2014, middle grade) is a lovely home-based timeslip fantasy to offer the introspective young girl (which is to say, if you don't know me already, it was a lovely book for me!). By "home-based" I mean a story in which the time travelling doesn't lead to grand adventures in exciting elsewheres. This is one that sticks close to home, and so it isn't one for those who want excitement--more for those who are fans of realistic fiction about ordinary girls, but with a magical twist. Ashley is miserable. Her best friend has gone off to camp, and her mother has invited the child of a friend to spend the month with them--a seven year old girl named Claire, who's lost her own mom, and who Ashley is expected to babysit. But two things happen that make the month the opposite of terrible. Both the Claire story and the timeslip story are interesting in their own right for those who like character-driven story full of small happenings and several nice surprises (one of which involves Ashley's favorite author, so especially pleasing for us bibliophiles!). The whole ensemble comes together very nicely indeed to make the story of this month in Ashley's live a lovely, warm reading experience that I enjoyed lots. Oh wow, I've never read a book in which the main character was face-blind, either. Interesting!